Patanjali Kesh Kanti Aloe Vera Hair Cleanser can be used to treat hair loss effectively. The natural herbal ingredients present in this shampoo help to improve the growth of hair. They also enhance the strength of the hairs and prevent their breakage. Patanjali Kesh Kanti Aloe Vera Hair Cleanser makes the hair soft, and smooth. It provides a natural, healthy shine to the hair. It cleanses the scalp and oily hairs without stripping the moisture. It also acts as an astringent and a hydrating agent. A regular shampooing of the hairs with Patanjali Kesh Kanti Aloe Vera Hair Cleanser can nourish the scalp and the hair roots and allow for an enhanced growth of the hair. The rich content of vitamins present in the herbs used in this shampoo ensures the scalp is supplied with the essential nutrients that are needed for the healthy growth of hair. This helps to provide long-lasting results for the people suffering from hair fall. The herbs in this shampoo also offer a rich source of vitamin E and fatty acids, which lock in the much-needed moisture into the hair thus preventing excessive dryness, which is a common cause of hair loss. It is suitable for both types of hair, dry as well as oily. It prevents the thinning of hair and breakage caused by the dry, tangled hair by keeping them well moisturized. Additionally, Tulsi present in Patanjali Kesh Kanti Aloe Vera Hair Cleanser acts as an antibacterial agent and prevents hair fall caused by infections. It acts as a natural moisturizer and helps strengthen the hair shafts thus preventing breakages. 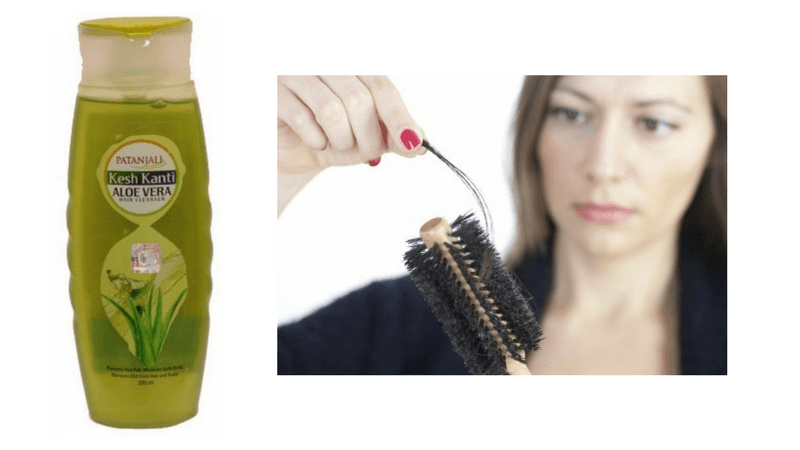 What are the side effects of Patanjali Kesh Kanti Aloe Vera Hair Cleanser? Patanjali Kesh Kanti Aloe Vera Hair Cleanser can make the hair look frizzy. This can be prevented by using a mild herbal conditioner after rinsing the hair. Patanjali Kesh Kanti Aloe Vera Hair Cleanser is suitable for the people having a normal to oily as well as a dry scalp. It may not be suitable for the people who have a very dry scalp and hair. Use a small amount of Patanjali Kesh Kanti Aloe Vera Hair Cleanser to massage the scalp for a few minutes. Rinse it off with plain water.